One thing is certain about Christmas is that it is rooted in many traditions and superstitions relating to nature that existed long before Christmas and many have continued in one form or another to the present day. 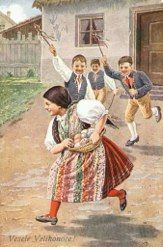 The many strands of Christmas can be seen in the variety of different traditions associated with, or originating in, places all over Europe. 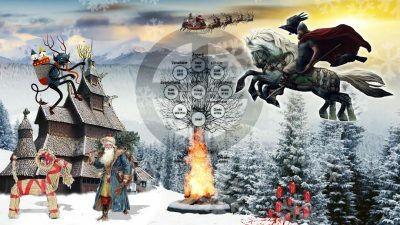 These strands are, inter alia, the solstice, the Nativity, Saturnalia, Yuletide, St Nicholas, Father Christmas, and Grandfather Frost (Ded Moroz). The association of Christmas with its earlier midwinter nature worship traditions declined as the Church exerted its power and authority over pagan practices and in more recent centuries as the industrial revolution took people away from the land and into the cities and factories. Since then industrialisation has taken over many aspects of people’s lives as they shifted from being producers to consumers. As direct contact with nature declined and scientific knowledge was applied to production, our lives were made easier by an abundance of relatively cheap goods and food. These benefits have come at another price though as industrialisation and technology the world over pushes nature further and further into ecological crises. There is much discussion and debate about the potential for a tipping point as the destruction of ecosystems and climate change move headlong towards irreversible damage of the Earth’s biosphere. This has come about, partly due to our alienation from nature, but also due to a system which blinds us to the excesses of production through mass media, and Christmas has become the vehicle for the worst excesses of industrialisation, commercialisation and commodification. However, this is a gross distortion of its roots in respecting nature and nature worship which was ultimately about a heightened awareness of survival in an unpredictable world. The predominant figure of Christmas has become Santa Claus (Dutch: Sinter Klaas) and originated in the stories around St Nicholas, the 4th century Bishop of Myra (Turkey), giving anonymous gifts to help people in need or trouble.1 In many European regions St Nicholas came door to door with a bishop’s mitre and crosier on his feast day, December 6. He was accompanied by his helper Ruprecht or Krampus as he is known in the Alpine regions. 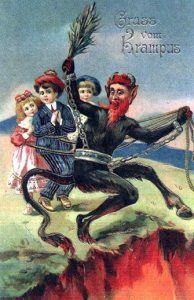 Krampus is depicted as half goat and half demon and punished misbehaving children with a rod. Another major association of Norse mythology with Christmas is the reindeer pulling the Santa’s sleigh. The first mention of St Nicholas in the air in popular mythology is of him “riding jollily among the tree-tops, or over the roofs of the houses, now and then drawing forth magnificent presents from his breeches pockets and dropping them down the chimneys of his favourites” is by Washington Irving in his satirical work, A History of New-York from the Beginning of the World to the End of the Dutch Dynasty, by Diedrich Knickerbocker (1809). At this point St Nicholas was not associated with Christmas and presents were exchanged on the night before his feast day on December 6. 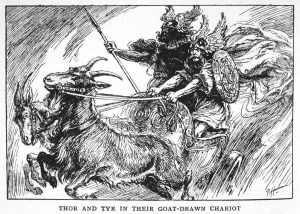 The phenomenon of flying animals has long been associated in Norse mythology with Wotan (Odin) and his flying eight legged horse Sleipnir, and with Thor and his flying goat-drawn chariot. 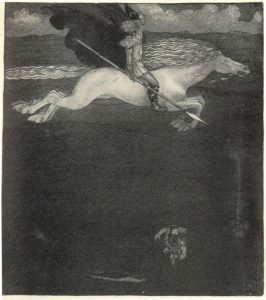 Wotan is depicted as one-eyed and long-bearded in Old Norse texts and is a fierce god associated with wisdom, healing and war. Children would leave straw in their boots for Sleipnir by the hearth and Wotan would exchange it for a gift in return for their kindness. Thor was also depicted as a fierce god of thunder and lightning, storms, oak trees and fertility. Another god, Morozko, the powerful and cruel Slavic god of frost and ice could freeze people and landscapes at will, became known as Ded Moroz (Grandfather Frost) but was eventually demonised by the Russian Orthodox Church. As our fear of nature declined and Christmas became more of a child-centered celebration, the depictions of these gods became less fierce over time. The flying aspect of Santa’s reindeers is believed to refer to the reindeers’ fondness for Fly Agaric mushrooms associated with Old Nordic Shamanism. The Shamanic ‘flight of the soul’ was part of the culture of people in arctic Europe and Siberia who would communicate with the souls of their ancestors in an altered state of consciousness helped along by the hallucinogenic mushrooms.6 Like the Church attempts to eradicate the earlier fertility traditions and the gods associated with them, shamanism has been considered mere superstition and attacked by both Churches and governments alike. It seems that what shamanism and fertility rites have in common is the idea of directly engaging with nature to secure desired material or spiritual goals. Both Krampus and Shamanism have been associated with Satan who “uses deception and demonic spirits seeking our destruction” yet their popularity has ebbed and flowed over the centuries without disappearing altogether. Similarly the Bacchanalian aspect of Christmas celebrations is a survival of Saturnalia, the Roman celebration of Saturn the “god of generation, dissolution, plenty, wealth, agriculture, periodic renewal and liberation” which could also be described as an engagement with the cycles of nature. Saturnalia was “a time of feasting, role reversals, free speech, gift-giving and revelry” held on December 17 of the Julian calendar and was subsequently extended to 23 December. Saturnalia originated as a farmer’s festival to mark the end of the autumn planting season in honour of Saturn (satus means sowing). were the Aborigines, whose king, Saturnus, is said to have been a man of such extraordinary justice, that no one was a slave in his reign, or had any private property, but all things were common to all, and undivided, as one estate for the use of every one; in memory of which way of life, it has been ordered that at the Saturnalia slaves should everywhere sit down with their masters at the entertainments, the rank of all being made equal. Puritans believed Christmas was basically just a pagan custom that the Catholics took over without any biblical basis for it. The holiday had everything to do with the time of year, the solstice and Saturnalia and nothing to do with Christianity. Presumably the masters could not cope with the concept of equality and saw Saturnalia instead as a role reversal. 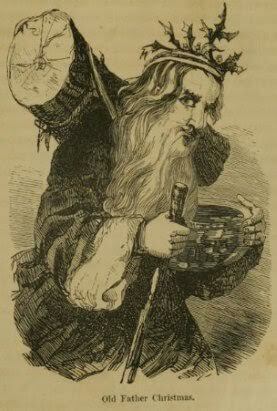 In pre-industrial England people would elect a Lord of Misrule who would be in charge of Christmas festivities and who even had license to poke fun at the nobility.7 Yet the Lords of Misrule were an important aspect of Christmas as the reversal of traditional social norms was a safety valve for class tensions in England. It was around this time that the personification of Christmas as Father Christmas began to appear. All the liberty and harmless sports, with the merry gambols, dances and friscals [by] which the toiling plowswain and labourer were wont to be recreated and their spirits and hopes revived for a whole twelve month are now extinct and put out of use in such a fashion as if they never had been. Thus are the merry lords of misrule suppressed by the mad lords of bad rule at Westminster. a large crowd of Londoners gathered to prevent the mayor and his marshalls removing the Christmas decorations which some of the city porters had draped around the conduit in Cornhill. The confrontation ended in uproar, with arrests, injuries, and the bolting of the mayor’s frightened horse. The Christmas celebrations returned with Charles II in 1660 and showed once again the attempt to impose a narrow religious view on the multifaceted ancient traditions of people had failed. Somewhat earlier, in the 14th and 15th centuries in Germany, craftsmen began to decorate their guild halls with trees and adorning them with fruits and nuts. This eventually led to the German, Charlotte, who married King George III in 1761, potting up and decorating a yew tree and initiating the custom in England. Legend has it that in Germany, St Boniface, an historical figure from the 7th century, saw a group of people honouring the sacred tree, Donar’s Oak (sometimes referred to as Thor’s Oak) somewhere around Hesse, became angry and chopped the tree down (and added insult to injury by using the wood to build his church). Some were wont secretly, some openly to sacrifice to trees and springs; some in secret, others openly practiced inspections of victims and divinations, legerdemain and incantations; some turned their attention to auguries and auspices and various sacrificial rites; while others, with sounder minds, abandoned all the profanations of heathenism, and committed none of these things. Over time, cutting the evergreen tree and bringing it indoors became an important part of Christmas traditions [see my previous article on Christmas trees] despite church proscription, because of its shamanic-pagan past. In parts of Medieval Britain, a different sort of wassailing emerged: farmers wassailed their crops and animals to encourage fertility. An observer recorded, “They go into the Ox-house to the oxen with the Wassell-bowle and drink to their health.” The practice continued into the eighteenth century, when farmers in the west of Britain toasted the good health of apple trees to promote an abundant crop the next year. Some placed cider-soaked bread in the branches to ward off evil spirits. 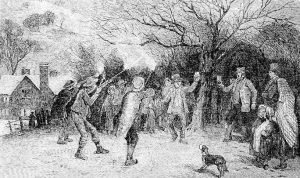 In other locales, villagers splashed the trees with cider while firing guns or beating pots and pans. (It’s) Our wassail jolly wassail! Our awareness of mid winter and the solstice (‘sun stands still’) is shown to go back to the late Neolithic and Bronze Age with Newgrange in Ireland and Stonehenge in England. In both cases the monuments have been aligned to the solstice, sunrise at Newgrange and sunset at Stonehenge. It has been the occasion of celebrations, rituals and gatherings as the sun appears to be reborn and the days start getting longer again. After this time food became scarce (January to April) which were known as the ‘famine months’. It was the last feast of the year as cattle were slaughtered and wine and beer were ready for drinking. The ‘rebirth’ of the sun was known as Sol Invictus or the ‘unconquered sun’ god during the Roman Empire in the 3rd century CE and the Emperor Aurelian dedicated a temple to Sol to be celebrated on December 25. Solar deities have been represented as both gods and goddesses in different cultures and are particularly important in mid winter when the sun is low in the sky. In many countries in Europe the tradition of the Yule log burning was an important festival to help strengthen the weakened sun. 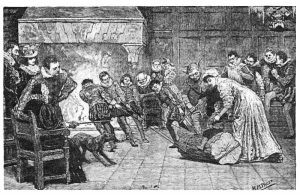 A large log, big enough to burn for the 12 days of Christmas, was brought into the houses and burned. It was believed to have originated with the Norse and the Celts who had large bonfires to welcome the return of the sun. The log was thought to have magical properties and the ashes were then used as fertiliser and as cures for both people and animals and would protect them for the year to come. Throughout the world there have been many forms of nature worship demonstrating that people respected and feared nature in equal amounts over the millennia. We have a complex relationship with nature, indeed we are an important part of nature. We have to negotiate every aspect of that relationship, be it food, water, reproduction, climate (storms avalanches, floods, droughts, fires), the seasons, the geophysical (earthquakes, tsunamis, volcanoes), light (length of day, sleeping during hours of darkness) etc. In the past people hoped and prayed that in the next year nature would allow them to live well again and consequently treated nature with respect. To do that people were careful not to over-exploit nature in various ways: by leaving land fallow, having food taboos, allowing areas to regenerate by moving on, by not over-using a food resource, thus creating the basis of sustainability into the future. Their respectful attitude to nature was reflected in what we call superstitions and paganism but it allowed them to celebrate Christmas without guilt in the knowledge that they had treated nature well and that nature would reciprocate with a bountiful harvest the next year. Today, on the other hand, we are alienated from this way of thinking and living to the extent that people have lost direct control of their relationship with nature. The ever increasing industrial overproduction of meat, over-fishing, over-fertilisation, deforestation, air pollution and extractivism is pushing nature to extremes and already we are seeing the catastrophic results of this in climate change. Maybe as climate change brings ever fiercer storms and destruction of food production we will learn to respect and fear nature again. This article was posted on Wednesday, December 20th, 2017 at 9:16am and is filed under History, Mythology, Religion.